CYP/// PU-8H8HBTE-4K22 är en 8x8 HDMI till HDBaseT matrixväxel som klarar att skicka HDMI med 4K2K, IR, Ethernet, RS232 och ström till mottagarna upp till 100m i en vanlig Cat-6 kabel. Perfekt för installationer i restauranger, sportbarer mm. även i större bostadsinstallationer där man vill bygga ett bild och ljudsystem för hela huset baserat på HDMI. 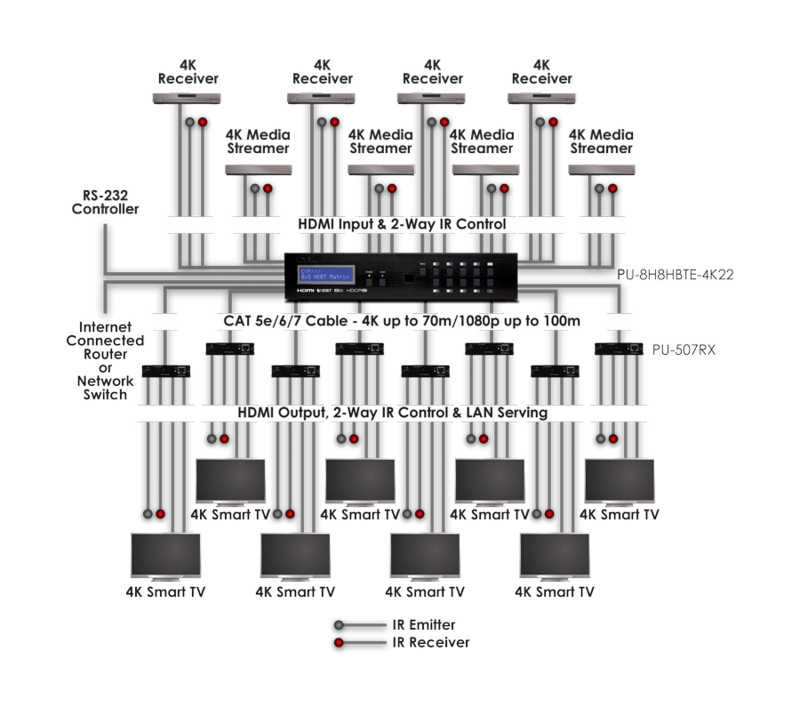 The PU-8H8HBTE-4K22 8 by 8 HDMI Matrix over CAT5e/6/7 supports the transmission of video (resolutions up to 4K2K Full HD, HDCP 2.2) and multi-channel digital audio from 8 HDMI sources to 8 HDBaseT outputs via single CAT5e/6/7 cables up to 100m. It supports high resolution digital audio formats such as LPCM 7.1CH,Dolby TrueHD, Dolby Digital Plus and DTS-HD Master Audio as well as 3D content that can be displayed when connecting a 3D TV and 3D source. This matrix features control via manual selection buttons, IR, RS-232, Telnet or Web GUI. CYP provide control drivers for all the major control systems. This unit also supports RS232 pass-through to the receivers. The PU-8H8HBTE-4K22 is designed to be used with any of the HDBaseT receivers that can utilise the PoE and LAN capabilities of the matrix. The LAN serving capabilities of the matrix provide network connections in every zone.